It can take days on safari to track the lions inside protected areas, but when Dr Neil Jordan's team finds an adult wandering by itself they act fast. A trained veterinarian takes aim and shoots a dart into the lion's thigh. It is loaded with an anaesthetic that will eventually put the animal to sleep. When that happens, Jordan and the vet attach a GPS collar to its muscular neck. This safe device, which is programmed to automatically drop off after two years, sends radio signals to a satellite. Once activated, it will give Jordan and his team real-time information about the lion's movements on their mobile phones. Jordan has done this type of collaring many times before, but it still makes his heart race. "It's intense," he says. "We stick someone on the roof of the vehicle scanning for other lions. We're not worried about the sleeping lion, but its friends. They pose a real risk." The whole process takes about 30 minutes, and when they are done they give the lion a reverse-sedative to wake it up. "We're very careful that we manage the animal, and we release it in as good condition as we found it," says Jordan. "Within an hour, it's wandering away with a new, shiny collar." The tracking is one part of Jordan's research; the lions' predatory behaviour is another. With less space set aside for conservation in Botswana, lions are more frequently coming into contact with human populations, says Jordan. These are usually farms, expanding around the edges of the protected areas. The lions eat livestock, such as cattle, which negatively impacts the livelihood of the subsistence farmers in these rural areas, he says. Without a non-lethal way to prevent these attacks, the farmers often turn to deadly force, shooting or poisoning the lions in retaliation. Jordan says this has resulted in lion populations "draining away". The African lion is listed as vulnerable on the IUCN Red List of Threatened Species, with declining adult numbers currently in the range of 23,000 to 39,000. These are down from population estimates above 100,000 in the 1990s. 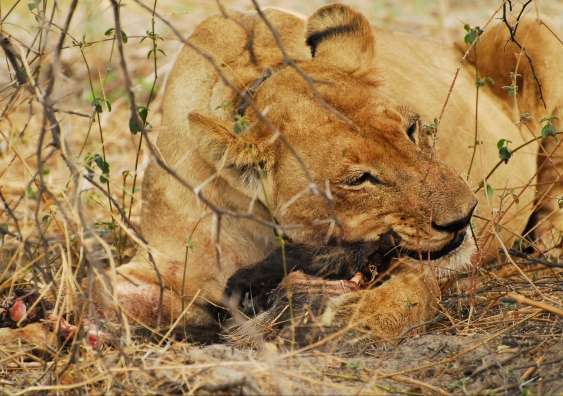 There are knock-on effects: poisoned carcasses don't just kill lions, but harm a range of other threatened organisms, including wild dogs and vultures. Furthermore, when a lion is killed, it doesn't solve the problem. It simply creates a vacant territory that another lion will move into, and the attacks will continue. "The ideal thing is to teach the lions in your area not to kill livestock," says Jordan, who holds joint positions at UNSW's Centre for Ecosystem Science and the Taronga Conservation Society Australia. He's come up with a low-cost solution that could, in essence, train lions to stop hunting livestock. It's a solution he hopes will promote a more peaceful co-existence between farmers, their livestock and Africa's top carnivores. Jordan's idea was hatched after two lionesses were killed by farmers in a village, near where he'd been working with the Botswana Predator Conservation Trust. "The lions had been hanging around and the villagers felt helpless to prevent the attacks against their livestock," Jordan recalls. "I felt helpless to assist." An attempt by the government's Department of Wildlife to intervene and relocate the lions was unsuccessful, and they were eventually shot. "A short time later, I was watching a lion hunt an impala," he recalls. "Lions are ambush hunters, so they creep up on their prey, get close and jump on them unseen. But in this case, the impala noticed the lion. And when the lion noticed it had been seen, it gave up on the hunt." In nature, patterns resembling eyes on butterflies are known to deter hungry birds, he says. Similarly, in India and other parts of Asia, woodcutters in the forest have worn masks on the back of their heads to ward off man-eating tigers. Jordan's idea was to "hijack this mechanism" of psychological trickery. By painting intimidating eyes on the backsides of cattle, Jordan hypothesised that farmers might be able to trick the lions into thinking they'd been spotted by their prey. If it was successful, it could keep all the animals safe. "We wanted a tool that could be used by the average subsistence farmer in Africa," he says. "With our solution, the total annual investment in paint and necessary supplies is just one-fifth the cost of one cow. "Because it's cheap, and relatively easy to do, we thought we'd give it a go." Last year, Jordan collaborated with the BPCT and a local farmer to trial the innovative conservation approach, which he's dubbed "i-cow". 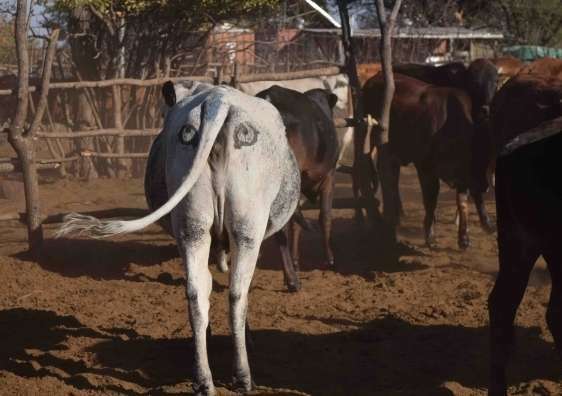 They painted eyes on one-third of a herd of 67 cattle, stamping the designs on to the rumps of the cows using foam cut-outs as they moved single-file through a crush gate. Each night, when the cows return from grazing to their protective enclosure, the researchers would do a head count. The early results from this 10-week trial were promising: three unpainted cows were killed by lions, and no painted cows were killed. "It's encouraging, but it's too small a sample size to say whether it was just due to chance," he says. In mid-July, he returned to Botswana to begin a second field trial. 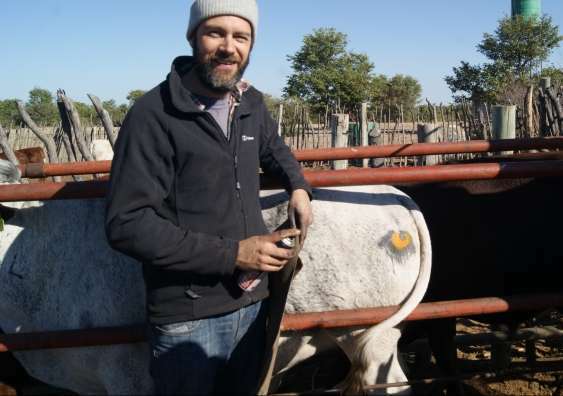 His team, including a UNSW PhD student, painted roughly half the cattle in a herd of 60, and used 10 cattle GPS loggers, purchased through a crowd-funding platform, to monitor where and when the cows and lions were moving, and coming into contact.